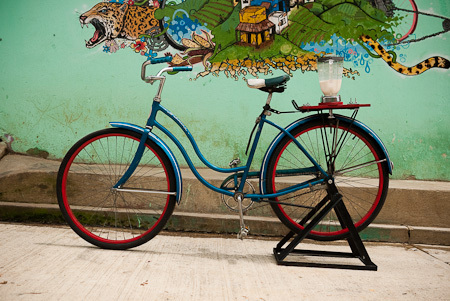 A few readers of this blog have emailed to ask more about the cool and funky Bicilicuadora – the bicycle-smoothie-making device – at Maya Pedal. 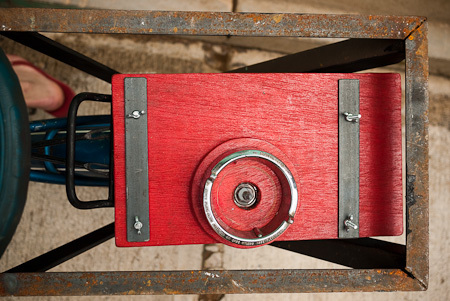 Here’s a few close up pictures to explain it in a little more detail, should you be inspired to create such a wonderful machine. 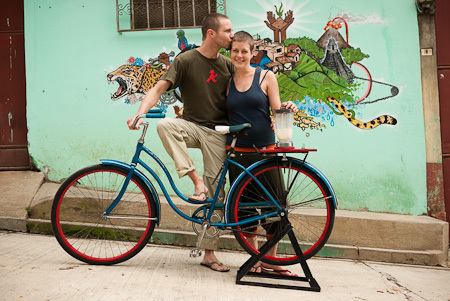 This particular Bicilicuadora is the reincarnation of an old, classic Schwinn, built as a mobile smoothie maker by Nina and Ilja as a showpiece to promote the organisation. Volunteers in Iztapa, Guatemala, can head down to the Antigua’s boisterous market, rustle up tasty smoothies and advertise what’s going on in the workshop. 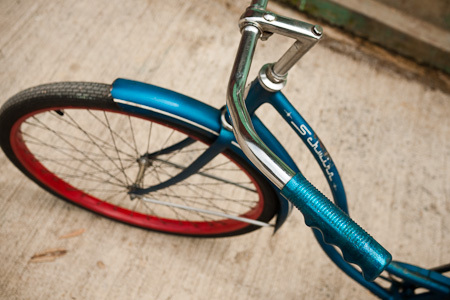 The nice thing about this version is that with a few adjustments, it could be mounted to almost any bike. In fact, you could even make a more compact one for travelling (and pay your way? ), or fit a larger board for chopping fruit. The whole project is pretty straight forward and shouldn’t take too long, depending on how much life your donor bike needs breathing back into it – in this case, it needed an overhaul. Building the stand and wooden mount took them a couple of days, with much of the time spent sourcing the materials amongst the oily boxes of Mayapedal’s hotpotch of spares. 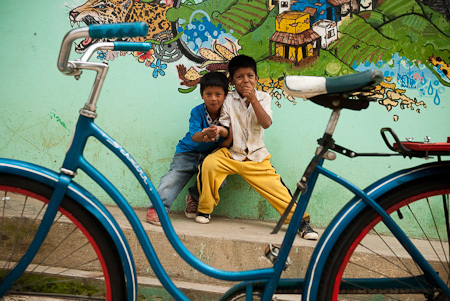 The Bicilicuadora is just one in a range of pedal powered machines built for the local Guatemalan communities – check out Maya Pedal for more info. The ‘Schwinncuadora’. A very cool smoothie making machine. No plug required. 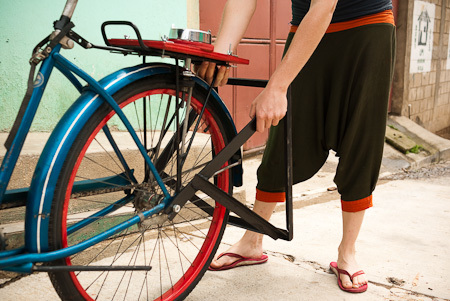 The blade is driven by a homemade ‘dynamo’, made out of a hub, an axle and a piece of an old Guatemalan truck tyre. 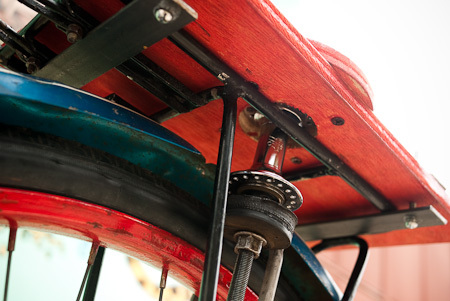 It’s adjustable by sliding the whole unit away from the stand, so the dynamo isn’t spinning while you’re riding around. The axle can either be cut down, or an appropriate piece welded on, to fit the underside of the blade in the jug. 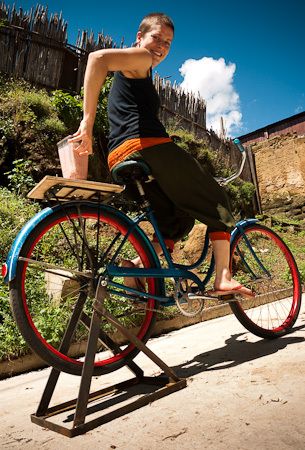 Frenzied pedalling provides fast enough revolutions to dice up soft fruit. 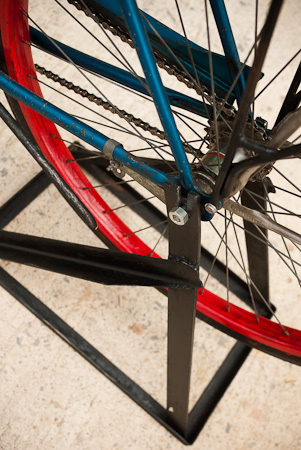 The base is detatchable, and allows the rear wheel to be lifted off the ground. It’s made up of simple pieces of square section steel. The ultimate exercise bike? It’s also hinged to swing up above the rack for transportation. 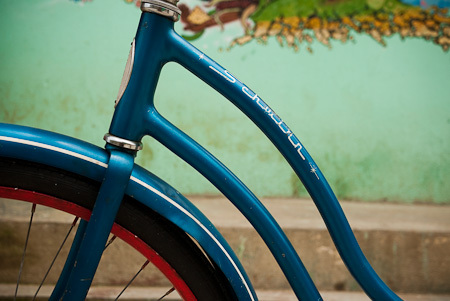 Beautiful brazing and a swoopy top tube lend it a timeless style. And here it is in action. For this smoothie, we threw in chunks of pineapple, mango and strawberries. Delicious. And some cheeky street munchkins who came along for a taste. 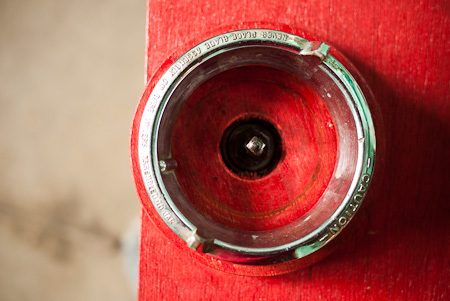 A fillet brazed blender! Yummy!